Lauren Rebecca: Scarlett Eats. A Toddler's Meal Plan. Scarlett Eats. A Toddler's Meal Plan. Scarlett eats pretty healthy. I like to think that it is what I fed her and that I gave her no other option. Whether it was that or I was blessed with a toddler who loves fruits and veggies, I don't know. Vegetables are the first thing gone from her plate, she prefers a fig newton or WhoKnu over a regular cookie and it's common to see her snacking on raw veggies. Scarlett went through fazes when she wouldn't eat anything. I got worried, called the doctor and he assured me she will eat when she is hungry. Sure enough, she did. She tends to not eat as much when she is teething. She also went through fazes when she would refuse certain foods but she is overall, a good eater. I try to feed Scarlett as organic as possible but sometimes, we just eat a good ole' pizza for dinner. Everything in moderation. I had someone ask how I got Scarlett to eat so healthy and what I feed her for food and snacks. No, I don't always have it written out and ready to go. Sometimes I wing it. I try to look at the whole day when I feed her. If she had fruit and a grain for breakfast, then I try to fit in a vegetable and meat for lunch. Maybe a dairy snack. I try to fit in all of the food groups. I grew up vegetarian so we rarely eat red meat. I'm not an expert mom. I simply feed her things that I would eat. It's not always easy thinking of nutritional food ideas for the littles. I thought I'd share her meal plan with you. you could write a baby cookbook. 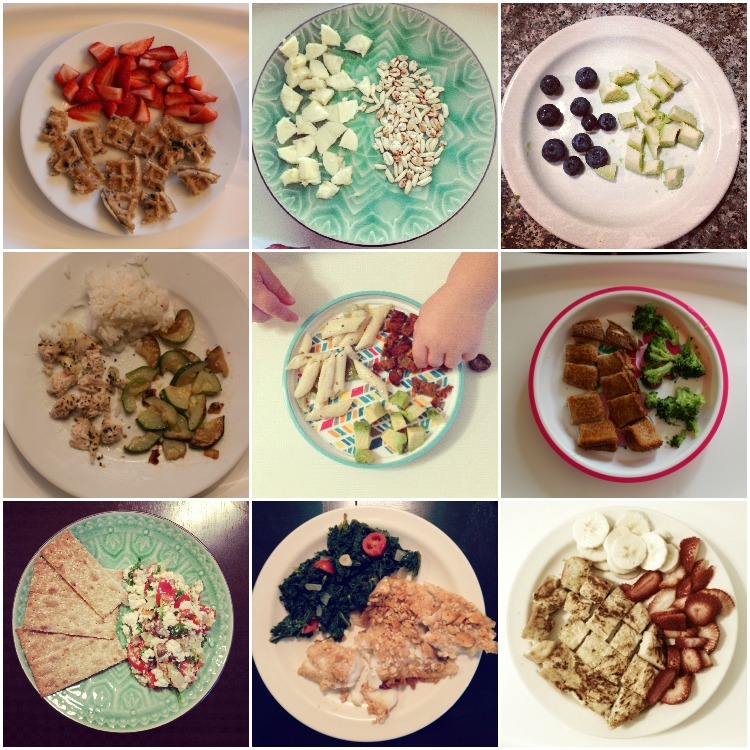 :) her meals look and sound so awesome and balanced! it reminds me of my mom - she always had every food group on our plate and made sure we ate our fruits and veggies. All that food looks great! I strive to feed my kids really healthy and they will go through so much veggies and fruits in a week. I love that they love the healthy stuff, but now that they have gotten a little bit older they sure do voice their opinions when they don't like dinner. Grr....it becomes a bit more interesting! This is great! I have been looking for some good healthy meals to make for my son! Thanks for sharing ! This s great, I'm going to try some of these ideas with my little one (duh, why did I never think to try pasta salad!). Does she eat all the food on her plate? Molly is 21 months, but she'd eat like a quarter of one of those plates and I and I can't figure out if she just stops as soon as she doesn't feel hungry or if she's really had enough!